The battle between Intel and AMD can often seem rather brutal, but it looks like hostilities have paused, at least for now. Both Intel and AMD have announced that the two companies will release an upcoming Intel Core H laptop processor, which combines Intel’s CPU technology with AMD’s Radeon graphics. The idea is that thin and light laptops running the chip will be able to display high-end games while maintaining a svelte and lightweight design. While on paper the idea of Intel and AMD working together is revolutionary, it’s actually not that much of a surprise – we reported on the rumors of a collaboration last month. Also, while Intel and AMD are fierce competitors in the CPU market, on the graphics side of things there is far less animosity, as Intel’s integrated HD graphics have never tried to compete with the likes of AMD or Nvidia. According to Intel, combining its Intel Core H-series processors with a custom third-party AMD graphics chip into a single processor package will lead to thinner laptops with a reduced silicon footprint that’s over 50% smaller. This is thanks to Embedded Multi-Die Interconnect Bridge (EMIB) technology combined with a new power-sharing framework that’s been made by Intel to coordinate information between the processor, graphics chip and dedicated graphics memory. As Intel’s Christopher Walker explained in a blog post, "it’s a prime example of hardware and software innovations intersecting to create something amazing that fills a unique market gap." EMIB is a small, intelligent bridge that allows heterogeneous silicon to quickly pass information in extremely close proximity, allowing for smaller devices and less complex designs, and the Intel-AMD collaboration will be the first consumer product to take advantage of EMIB. The new addition to the Intel Core H-series of mobile processors will also be the first to use HBM2 in mobile PCs, which requires less power – and is smaller – than traditional technology which uses GDDR5 dedicated graphics memory. We’ve not had any concrete information on when the new chip will release, though Intel and AMD expect it to launch in the first quarter of 2018. 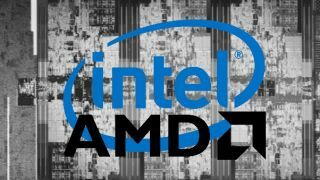 We’ll keep you updated with any further news that we hear about this collaboration between Intel and AMD. Until then, let’s all bask in the glow of two sworn enemies putting aside their differences to help bring better experiences to consumers.